A Chinese recycling magnate's bid to buy Jalopnik has fallen at the first hurdle, after he allegedly made bizarre remarks regarding hipster businessmen. Chen Guangbiao had previously expressed his desire to buy Hooniverse, but after he failed to convince the website's shareholders, he turned his attentions on the acquisition of its rival publication. 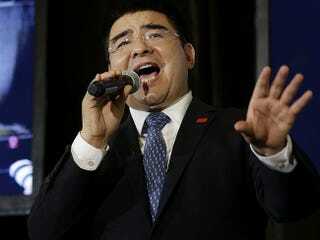 However, in an interview with Sinovision, a New York-based Chinese television station, Mr Guangbiao made the controversial claim that he was the perfect owner as he is 'very good at working with hipsters'. Clarifying his bizarre comments, he said that many American automotive websites were owned by hipster businessmen, and that he apparently had 'equally competent IQ and EQ,' stating that not only can he understand the emotion of driving an old Alfa; he is smart enough to have a towing service on speed-dial. Speaking of his previous attempt to buy Hooniverse, he said: 'I intend to buy Hooniverse, this is not a joke. 'The tradition and style of Jalopnik make it very difficult to have objective coverage of China's car industry. Mr Guangbiao already has a reputation for his bizarre business activities, having previously sold cans of fresh air to Beijing residents suffering from the poisonous smog blighting the city. For further reporting, see here.